The Jul 2 is slated as a single tubular belay device. It’s tied for the least-expensive brake-assist device on the market at $29.95. It’s most similar to the Edelrid Mega Jul ($34.95) and the Mammut Smart ($29.95), but adds the benefit of a much softer catch. The stainless steel core means it will last for years without wear and it’ll reduce heat build-up on long belay sessions. The Jul 2 is no longer coming out in Spring 2015. Now due to release in Fall 2015, the Jul 2 will include changes to become a brake-assist device instead of just a brake “boost” device This change stems from studies conducted by the German Alpine Club and Edelrid that found high misuses of climbers using tubular devices. You can read an official Edelrid Jul2 update in english (PDF). The end of the article mentions that starting in 2016 Edelrid will no longer sell any standard (non-brake-assist) tubular devices. At this time we’re not sure all changes the Jul 2 will go through (looks/price/stats), so the following post has not been updated to reflect Jul 2 Fall 2015 updates. The Jul 2 was made to excel while handling the thicker ropes typically found in gyms. Bring on the oldest, fuzziest, fatty ropes and the Jul 2 will impress. You’ve probably noticed the well-used 10.5mm ropes that many gyms provide challenge your belay device, and test your strength as you attempt to stuff that fat rubbery python into your device. The Jul 2 eliminates this problem with its wider rope slot. Compared to the Jul 1, the modified geometry allows for easier, more controlled lowering via the brake-assist functionality. Quick aside: The world’s largest climbing association, the German Alpine Club (DAV) has conducted climbing gym studies that found belaying with a brake-assist device is much safer in terms of number of belaying errors found during use. This has caused a debate to teach only assisted locking devices on beginner’s courses. Taking initiative on preventing belaying accidents, there are single gyms in Germany, where Edelrid is based, that sell more brake-assist Mega Jul’s than the entire US market. Similarly, some Canadian gyms are only allowing the use of brake-assist devices for belaying. And this is why you’ll find many American gym climbs pre-equipped with GriGri’s. Instead of instantly locking up during a fall, the Jul 2 acts more like a brake boost, progressively catching the the fall. If the belayer does not apply any tension with their brake hand after the fall, the device will continue to let the rope slowly slide through the device. Since the Jul 2 “slips,” the belayer learns to never let go of the rope – a harmful habit often picked up with fully locking brake-assist devices. The reduced braking strength naturally allows for a dynamic fall that is substantially more comfortable for the climber as compared to every other brake-assist device on the market (exception: CAMP’s new Matic belay device). This also means it’s a great device for your new climbing friends, who have yet to learn how to dynamically belay with their body. For giving slack you can use it exactly like a standard tube belay device. Or, you can hold the device up with the thumb loop, releasing the Jul’s tension as you pay out rope (see photos below). For lowering you also lift up on the thumb loop releasing tension to establish your preferred lowering speed (see photos below). The Jul 2 is rated to handle ropes 8.4mm – 11mm. Thinner rope will slide easier and thicker ropes will naturally add more braking force. Due to the stainless steel core the Jul 2 weighs in at 87 grams, heavier than most tubular devices. However, it’s still substantially lighter than all the mechanical braking devices. 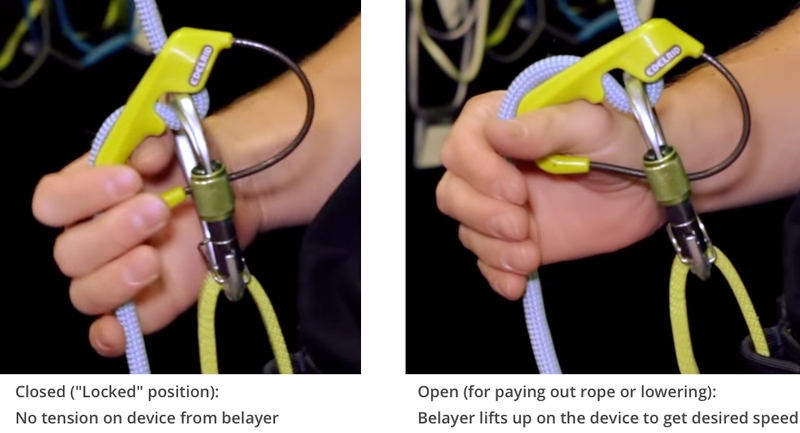 Click to see and compare every belay device available on the market. The only challenge with the Jul 2 is that it will have a harder time transitioning outside, past the single-pitch crag, when one needs the ability to rappel. This downfall exists with all single strand devices like the GriGri 2 ($99.95), Cinch ($85.99), and Click Up ($59.95). Although it is technically possible to rappel with a single-rope device, it requires advanced rappelling techniques and is not normal procedure. To really dial in your belay you can try using different HMS/Pear belay carabiners. Carabiners with a round cross-section basket will have less braking force and will be a bit gentler on your rope. A profiled carabiner (non-rounded, often an I-beam construction) will add more drag and braking power. For even more safety while climbing, Edelrid (and most other climbing manufacturers) recommend using a carabiner with a captive spring. This prevents the carabiner from twisting in the belay loop and potentially cross-loading the carabiner while catching a fall. Edelrid says this device was made for beginners, but any top-roping or single-pitch climber will enjoy the benefits. The Jul 2 provides a softer catch than most brake-assist devices, helps establish good belaying habits, and will last forever thanks to the steel core. And, since the handling is so similar to a tubular device, you’ll easily be able to switch between devices without needing to learn new techniques. If you want a device for top-roping and single-pitch lead belaying, the Jul 2 is a fantastic choice that won’t break the bank. >Quick aside: In Germany (where Edelrid is based) rock gyms now require all climbers to use brake-assist devices to help prevent belaying accidents. Thanks for the comment Alan, I’ll look into this further. Perhaps I misheard what Edelrid relayed to me. It’s also possible it was just gyms in a certain area but they used “Germany” to describe it since I wouldn’t know a more specific spot. Or, perhaps its a policy being debated but hasn’t gone into effect yet. I’ve already started inquiring and will update the post accordingly. To be a little less cryptic: what you’ve probably heard / slightly misunderstood is that the DAV (German Alpine Club) is considering – or has already decided, I’m not sure – to teach only assisted locking devices on beginner’s courses. Thanks for this clarification Alan. I’ve updated the post and will continue to update it as I get more information. I appreciate your polite and patient reaction to my initial rather curt comment. Your update tallies with what I’ve heard and read, both from DAV newsletters and from a friend who teaches beginners courses for the DAV. According to this which I used google translate on https://chalkr.de/edelrid-verschiebt-die-auslieferung-des-jul-2.html they are making saftey/design changes and it won’t be out until fall but the translation is bad so it’s not totally clear to me why. Good find David! I’ll check into this further and edit the post when I have an update. Thanks to you David, I just updated this post with an English version of the press release you found. Essentially, the Jul2 was safe in that it was a tubular device that included a brake boosting capability. But it turns out no non-brake-assist belay devices is as safe as an brake-assist device when it comes to the user experience. Edelrid wants to make sure they make the safest devices around, so they are in the process of eliminating all non-brake-assist devices from their line. This means the Jul 2, now coming out in Fall 2015, will become debut as a brake-assist device.